West Coast recap: “Just your existence makes a difference." 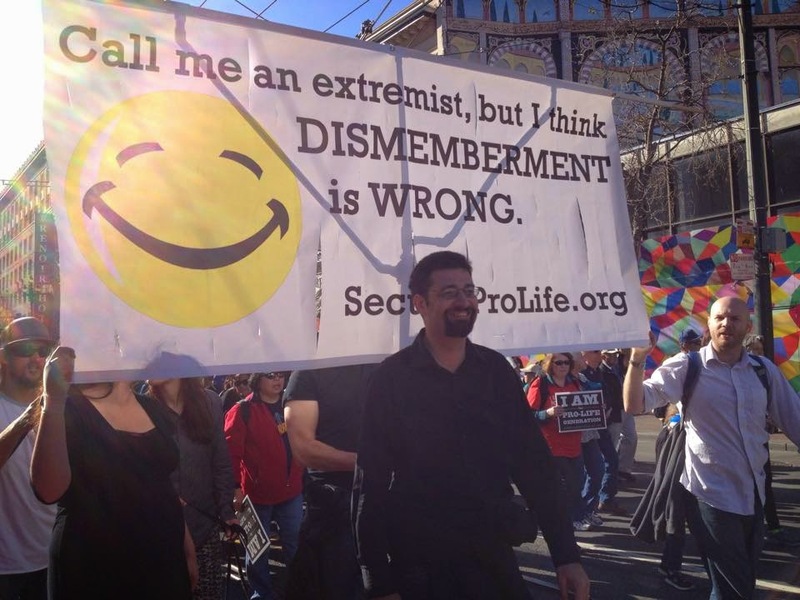 Last Saturday fellow SPL supporters and I marched in the West Coast Walk for Life through downtown San Francisco. To be blunt, I was not sure I was looking forward to it. I’ve done many SF Walks over the years, but this is the first year I was going to attempt one while 8 months pregnant. The very idea of the Walk seemed kind of exhausting. On the other hand, the Walk is a chance to see friends of mine in person who I usually only get to talk to online, so there was that to look forward to. I decided to just try to do the whole Walk, and if it got too difficult I could always head home early. SPL supporters gathered at our banner in front of the Asian Art Museum as the San Francisco rally began. We had a few people stop and tell us they like the banner, and we even had a few people tell us they liked SPL’s speech last year! I was impressed and happy they still remembered. Hanging out with pro-life people and their pro-life dogs before the Walk started. Once the rally started wrapping up we easily slipped into the embarking crowd near the front of what always ends up being a massively long column of people trailing down Market Street in San Francisco. Most years I like to dart in and out of the crowd getting as many pictures of the different signs as possible. No darting for me this year. Luckily pro-life atheist and amateur photographer Ellen took on the role enthusiastically. I wish I had pictures of her taking pictures—she even climbed up on subway walls and other places to get better vantage points. 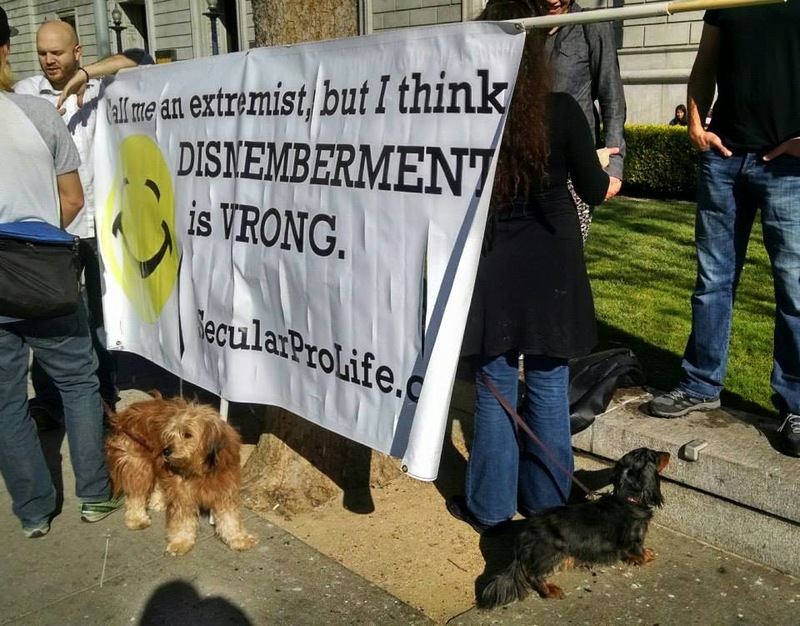 Meanwhile I walked alongside our banner and talked with Josh Brahm about the Walk, the effects of these kinds of pro-life events on people, and which signs we liked (or didn’t). With so many people milling down the street, the Walk moved at a place slow enough that I was able to keep up for the duration, which is nice. I was surprised at how few counter-protesters we saw. There were two or three here or there along the route, but most years there’s eventually a concentrated crowd of several dozen, usually with bullhorns and chants and plenty of signs that make for interesting photos. This year we saw none of that. When we got to the very end of the route there was a slightly larger group, but they seemed small compared to the thousands of pro-lifers overflowing from the street to the surrounding park and blocks around it. I think the counter-protesters’ message was largely missed by most on our side because of that. Not sure why they took that tactic this year. I think the only other year I’ve seen so few counter-protesters at the Walk was a year it was raining. Not sure what to make of that. I found out later that some of the counter-protesters who were around had tried to physically block the Walk, but we never knew about it at the time. Apparently the police (and many student groups led by SFLA) made short work of those efforts (fast forward to about 3m50s to see the police stop people from blocking the street)—the counter-protesters didn’t even slow the column down enough for us to notice a pause. Ha. After the Walk, several of the SPL supporters met up for pizza and card games and general fun, and it was great to get to hang out with everyone. I can only imagine what my life would be like if all my online friends lived in the same area. Ah well. The next day was the West Coast SFLA conference. 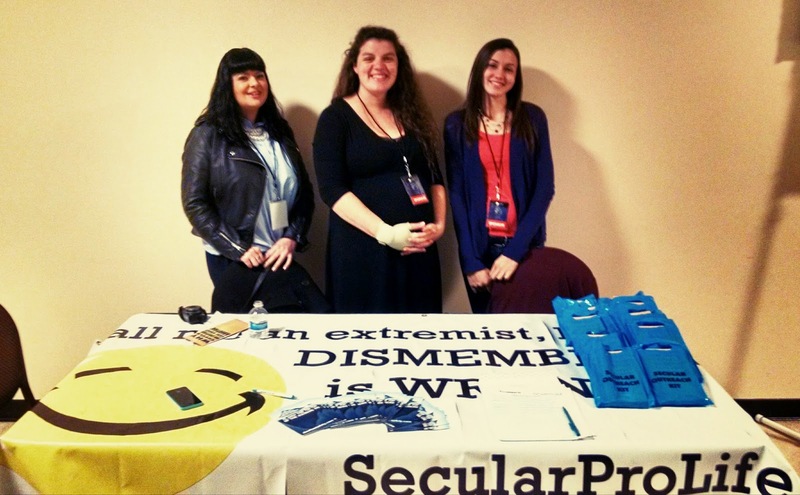 Ellen and I, along with pro-life atheist and SPLer Terrisa, arrived around 7:30am and set up SPL’s table. We were right between the tables for Life Matters Journal and Equal Rights Institute (two pro-life groups I consider good friends of SPL). We spent the day encouraging student groups to take one of our outreach packets, which contain brochures about why the pro-life positions is of interest to non-Christians and copies of our 10 Ways to Be Inclusive blog post. We had a lot of great conversations with people interested in SPL. So many people tell us how happy or relieved they are to see secularists join the fold and how frustrated they get when people dismiss their views because of religion. Several people told us they think SPL and groups like ours are the key to the future of the movement! And one gentleman in particular told me that, in his conversations about abortion, just being able to point to SPL’s existence has helped make people more open to what he’s saying. It is so encouraging to hear how SPL is helping the pro-life movement in little ways we never even know about! During the day we also got to talk with people who are leaders in their own pro-life organizations. Of course we talked a lot with our tabling neighbors, Life Matters Journal and Equal Rights Institute. We also got to chat with leaders from the Walk for Life, Feminists for Life, Priests for Life, And Then There Were None, 40 Days for Life, Students for Life (of course!) and many others. And we talked with a lot of students from different high school and college pro-life groups. Some of the schools that have had SPL for speaking engagements in the last year came over to say hi, and that was really sweet. Throughout the day I took a few notes on good ideas other groups had for making their tables interesting and engaging (for example, candy doesn’t hurt). I think next year I’d like to have more copies of some of our blog posts printed as leaflets. Which blog posts do you think would be most useful for a student pro-life conference? Overall it was a busy and enjoyable weekend. So good to see so many friends, get brainstorming ideas, and remember how many different kinds of people are interested in pro-life work. If you can make it to either a march or a conference (or both) I highly recommend it. Very thought-provoking and encouraging. In 1979, at a sold-out concert of The Who with approximately 18,000 fans in attendance, the force of the crowd at the entrance caused 11 people to be crushed to death. In 2008, a crowd of around 2,000 Black Friday shoppers flooded into a Long Island Wal-Mart, fatally trampling 34-year-old employee Jdimytai Damour. At the turn of 2013, a surge of people leaving a New Year's Eve fireworks display at an Ivory Coast arena trampled 61 people to death and injured over 200 others. Bottom line: under normal circumstances, you wouldn't voluntarily place yourself in front of a large crowd of people moving in the same direction unless you had a death wish. of "We! Are! The pro-life generation!" while waiting peacefully for police to clear the path. The members of Stop Patriarchy do not have a death wish. They want to live to see the Communist revolution. (Really.) But they didn't appear to be at all concerned for their safety when they stood in front of a moving crowd far, far larger than the ones that trampled people at a Who concert, a fireworks display, and a Wal-Mart. Of course, their confidence was objectively well-founded. But I can't understand why they felt that way. After all, we hate women and stop caring about human lives after birth... right? *Unfortunately, the National Park Service no longer provides official crowd size numbers. I was there and the 200,000 ballpark figure strikes me as reasonable, but I was toward the front and couldn't see everyone, so attendance may have been higher. 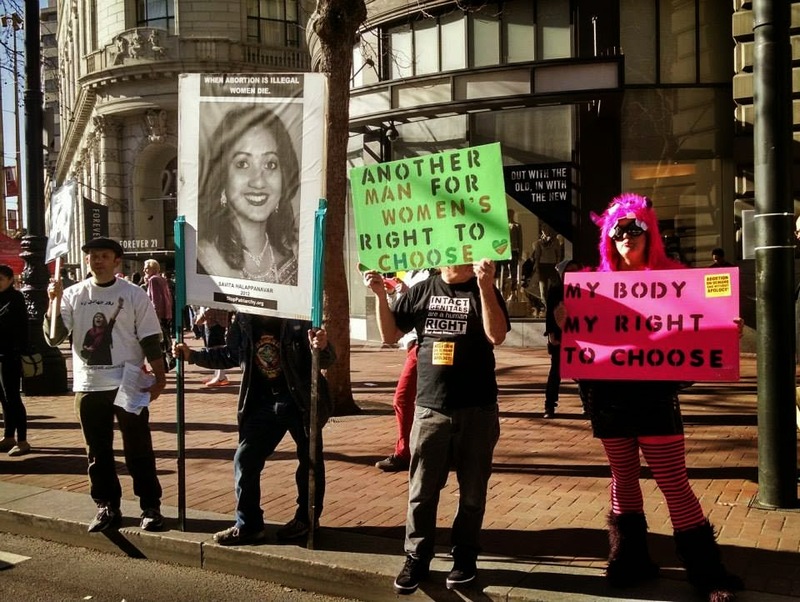 **They did an encore presentation of their stunt at the Walk for Life in San Francisco, which brings in a smaller crowd than the D.C. march. Your president Kelsey Hazzard here. What a whirlwind week! I'm finally home and able to look back on SPL's incredible advocacy for life on the 42nd anniversary of Roe v. Wade. "The world says I'm unwanted, but I am adopted and loved." it is merely oppression redistributed." Next, I stopped by the A Matter of Life live-stream show. Considering that it was after 4 in the afternoon and my "lunch" had consisted of a few pretzel sticks, I think I did pretty well! I was running on adrenaline and the emotional high of being surrounded by fellow human rights activists. A recap of SPL's activities in California for the West Coast Walk for Life will appear on the blog later this week. Thank you so much for all of your support! EWTN, the Catholic channel, has agreed to air the film in its entirety—including the interviews with Secular Pro-Life's Kelsey Hazzard and Pro-Life Humanists' Kristine Kruszelnicki! Booya! 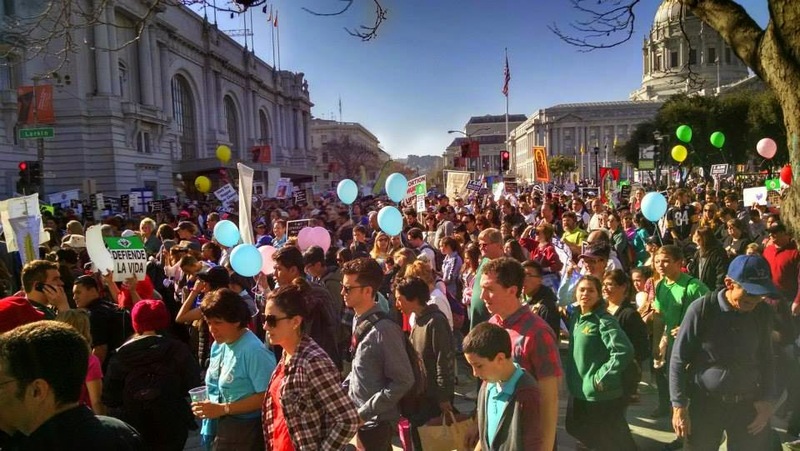 Those aren't throwaway appearances, either; 40 does a great job showcasing the diversity of the pro-life movement. If you haven't seen 40 yet, now's your chance to watch it for free. We'd love to see you at the March, but if you can't make it, tuning in is the next best thing! His father would get up at 5 o'clock in the morning, get him dressed, load him in the car, take him to the special care center where he'd leave him. "Eight hours later, I'd pick him up, bathe him, feed him, put him in bed, set my alarm for two hours so that I'd wake up to turn him so that he didn't get bedsores," Rodney says. Mr. Pistorius' story ends well, but I cannot begin to imagine what he went through. I can think of only one thing worse than hearing "I hope you die," and that is hearing "We are withdrawing your hydration and nutrition." Mr. Pistorius is not the first person to be misdiagnosed as a hopeless case. But the fact that it took twelve years to obtain a correct diagnosis has disturbing implications — how many families have the strength to wait that long? How many doctors would be supportive for that long? How many would instead urge the family to "let go" and end their loved one's life prematurely? It's been said a million times, but it bears repeating: have the end-of-life conversation with your loved ones. Let them know what care you want, and put it in writing. * He says he coped with his mother's statement "I hope you die" by contemplating how she must have felt: "As time passed, I gradually learned to understand my mother's desperation. Every time she looked at me, she could see only a cruel parody of the once-healthy child she had loved so much." Now that he is able to communicate, he and his mother appear to have a good relationship. Why hello, what have we here? 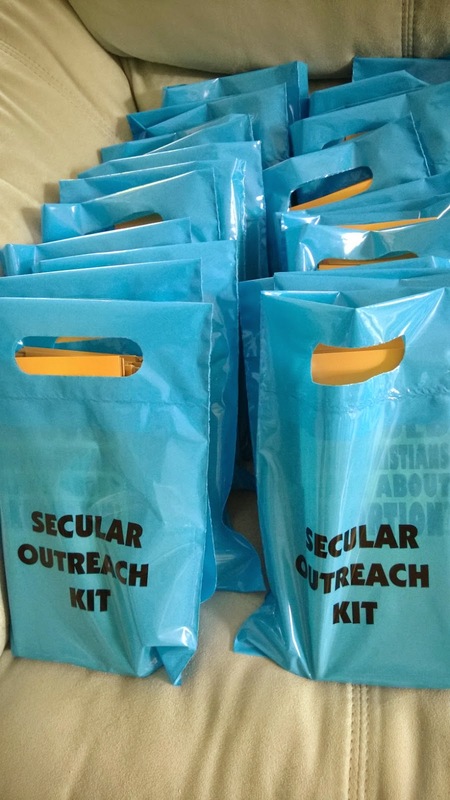 These blue bags taking over my living room sofa are SPL's awesome new secular outreach kits for student groups. They contain 50 copies of our Why Should Non-Christians Care About Abortion? brochure with space for a customized message on the back, plus tips for making your pro-life student group more inclusive, and some other goodies. We will be distributing the kits at both the East Coast and West Coast Students for Life of America conferences. (Registration is still open, but the conferences have sold out for the last few years, so don't procrastinate.) We have enough kits to supply 150 schools. Come by our exhibit booth and claim yours! 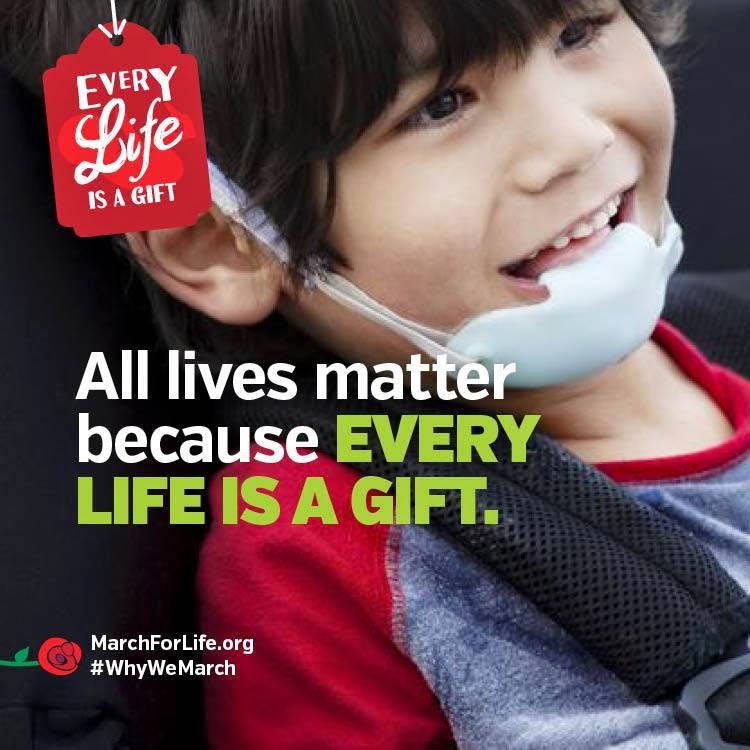 The theme of this year's March for Life is "Every Life is a Gift." This theme, as March for Life president Jeanne Monahan explained in an op-ed in The Hill, is meant to draw attention to unborn babies who have been diagnosed with a disability. The piece closed with an invitation "to more fully explore how every life is a gift," which I would like to do here. The idea of life as a "gift" frequently has religious implications—God as the giver of life—but Monahan's piece is entirely secular. As a secular person, I think about the gift of life in two ways. I'm also thankful for specific people who have shaped my life, and who have kept me safe for this long: most obviously my parents, and also my brother, extended family members, friends, teachers, and so on. People with disabilities share that sense of gratitude for their lives. The assumption that people with disabilities are constantly miserable, wishing they had never been born, is abhorrently ableist. 79 percent of [parents of people with Down Syndrome] felt that their outlook on life was more positive because of their child with Down Syndrome. In terms of siblings’ feelings about Down Syndrome and how such a diagnosis impacted their family, 94 percent of older siblings expressed feelings of pride towards their siblings with Down Syndrome; 88 percent expressed feelings that they were better people because of their siblings with DS autism. The list of individuals with disabilities who have made a positive impact on society writ large is a very, very long one. The world would be a much poorer place without their lives. This doesn't mean that every mother must view every pregnancy as a gift to them. Nor do I mean to suggest that it's wrong for a parent to react with fear, rather than gratitude, when given the news that their child has a disability. It's okay to be human! Life is messy and imperfect. But as messy as life is, it is nonetheless a gift. Every person deserves the chance to live and experience all this world has to offer, the good and the bad. And that is why I march. The American Association of Pro-Life Obstetricians & Gynecologists (AAPLOG) will hold its annual conference on Saturday, February 21, 2015 and Sunday, February 22, 2015 at the Georgetown University conference center in Washington, D.C. The two-day conference is intended for ob/gyns and medical students. Day one, and the morning of day two, will be dedicated to continuing medical education. Topics will include maintaining an ethical practice, abortion pill reversal, adolescent psychology, postpartum care, and the science of fetal pain. The afternoon of day two will branch out a bit, with topics from law, policy, and economics as well as medicine. Secular Pro-Life president Kelsey Hazzard address the conference on Sunday the 22nd at 2:00 p.m. Attendance at this conference is by registration only. Again, this is for medical audiences, and specifically providers of gynecological care. I realize that most of our readers don't fall into that category, but please pass this along to your pro-life friends who do! If you are willing to sponsor a student ($600 one time payment, which covers airfare, hotel and some of the meals) please donate online or send us a check [made out to AAPLOG and mail to AAPLOG Accounts PO Box 395 Eau Claire, MI 49111-0395]. Then email us at prolifeob@gmail.com and let us know that your donation is for medical student sponsorship. Pro-choice psychologist Magda Denes wrote a book on abortion, for which she observed abortions and interviewed clinic workers and abortion doctors. I quoted her here describing an aborted baby she saw at the clinic. Her book, In Necessity and Sorrow: Life and Death in an Abortion Hospital, was published decades ago, but much of what it has to say is still relevant today. There is a lot of valuable information in Denes’ book, including interviews with clinic workers and abortionists. I practice medicine not to make a living and yet I like to make money at it. We made a lot of money in abortions. I don’t really know why I did it. I sort of fell into it. I was the director of the service here, so when the abortion program came in I looked at it is sort of a challenge. We did set up a very good program. But then I could see from the point of view of management that they were less interested in the best program than in the best paying program. For the first two or three months I didn’t do any of the abortions… Then I suddenly realized I had all the headaches because whenever they ran into trouble I got involved. I took over gradually and worked two days a week and I found that I worked very hard, but it made an awful lot of money. Abortion doctors still make a lot of money today, as more recent interviews show. The abortionist quoted in the above passage doesn't seem to have set out to become an abortion provider. However, he found the work to be extremely lucrative. Although he insists that he does not practice medicine to make money, he admits that he likes the money that he makes. Also, he makes this “awful lot of money” by working only two days a week. There is another disturbing admission in this quote. The abortionist says that management was not interested in the best program—i.e. the program offering the best health care for women—but in the best paying program. Apparently, the administration of the clinic put financial gain ahead of women’s health. Why else would he distinguish between the “best paying program” and what he characterizes as the “best program”? Magda Denes, PhD. In Necessity and Sorrow: Life and Death in an Abortion Hospital (New York: Basic Books Inc.) 1976.